These are the vintage tins I picked up a couple weeks ago at St. Lawrence. The graphics and colour palette on the cigarette tin are so awesome. I have not idea what I’ll put in this tin, as it is very slim. 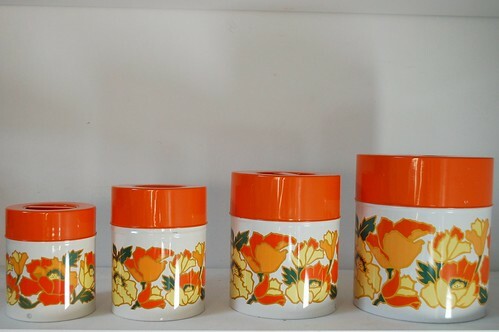 I couldn’t resist picking up the orange nesting tins from Japan because they are so fetching and in perfect condition. I don’t think they were ever even used! Here are a some links to distract you on a Monday. very excited about Gayla’s new book – Grow Great Grub and the book launch party! free origami wrap sweater pattern from uniform studio! this pygmy hedgehog is the crazy cutest thing!! cigarette tins are very good to put loose and sheet stamps in. now that canada post’s rate hikes are a yearly occurrence, it makes sense to have such a thing around. Love that cigarette tin! Might be good for paper clips & such? 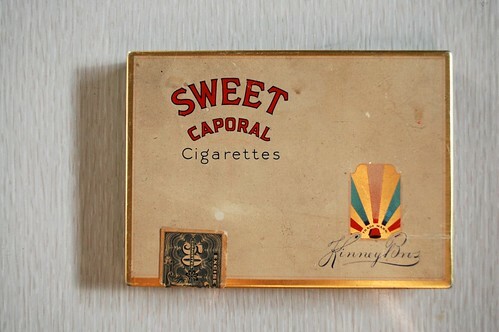 oh WOW – i had (what i think was) the exact same cigarette tin as a little girl. i kept crayons in it! 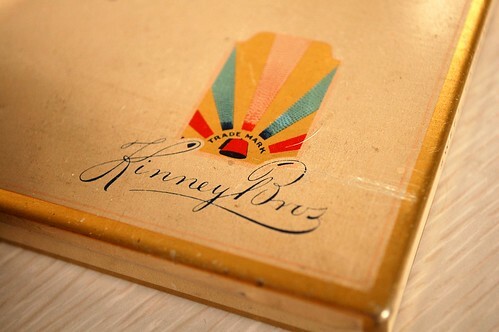 it was definitely a think sweet caporal tin, the excise sticker was in the same spot…the only thing i’m not sure of is whether the kinney bros logo was the same. that is a total blast from the past! what great ideas for these tins! i forsee myself buying many more.